It is still unclear what will happen to NBC News Anchor, Brian Williams now that it has been exposed that he lied about being in an air craft that was hit by rocket fire in Iraq twelve-years ago. Maybe, the Democrats will try to draft him to run for President! 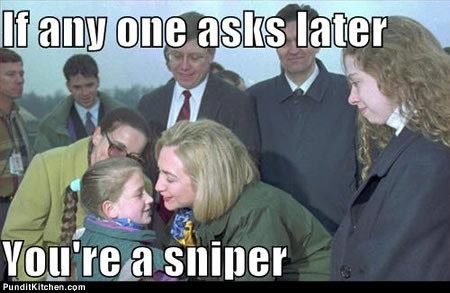 Williams' lie is eerily similar to one that was told by Hillary Clinton in which she claimed that she faced "sniper-fire" while visiting Bosnia in 1996. In fact, as CBS reported, there was no sniper fire - but there actually was a landing ceremony. It's hard to imagine that Williams will not receive some kind of reprimand from NBC if not lose his job entirely. A news anchor who is an admitted liar is pretty useless. But, Hillary seems to have gotten away with her lie for the last 20 years or so. I guess that when it comes to the Clintons, this kind of thing is to be expected and brushed aside as normal behavior.